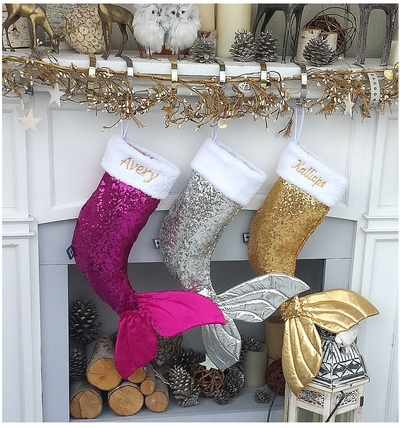 These sequin mermaid tail Christmas stockings are glitz and glamour fun decor to give the mantel that extra bit of flare and and bling. Featurng a white fuax fur cuff where the personalization would go - Looks great in our Gold or Hot Pink thread. Materials: Sequins on the front and fabric on the back, trimmed with short faux fur cuff.